← October is Family History Month! This post is courtesy of Cousin Mike Wise from Georgia. I appreciate everyone’s patience while I comb through Cousin Mike’s archive of research and start posting it online here at Knapp Notes. On the Document Gallery tab, I have added a menu item called Wise Guys. I will be starting to post copies of the original documents there. The term “Rhenish Bavaria” translates to “Bavaria near the Rhine.” It is located in a valley on the west side of the Rhine river only a few miles north of the French border, near the towns of Bad Bergzabern and Wissembourg. Just outside the valley is a grape-growing region, but in the valley itself, it is too cold to grow grapes. Jacob Weiss came to America in 1840 with his wife, Mary Magdalena HAMMER. Also making the trip were Mary’s brother and sister, Dominick and Louisa HAMMER. They settled first in Canal Fulton, Ohio, for several years and the HAMMER descendants still live there today. After living in Canal Fulton for several years, Jacob and Mary WEISS moved their family to Lake Township in northern Stark County, Ohio. The place was on the northwest corner of 619 and Doucette Avenue. His house was about one mile east of Hartville, Ohio. Jacob WEISS‘s father, Adam WEISS, and his mother, Frances BURGER, never migrated to the USA. Mary BURGER‘s parents, Johanne HAMMER and Elizabeth OEKENHAEFER, never migrated to the USA. Jacob WEISS was born 14 April 1801 and died 4 August 1865, and is buried at St. Joseph’s Cemetery in Randolph, Ohio. Mary HAMMER WEISS died 10 April 1873 and also is buried in St. Joseph’s Cemetery in Randolph. The couple were married in 1827. NOTE: After coming to America, they changed their name to WISE. Cristina WISE, born 4 Jan 1828, who married Nicolas SCHRADER on 12 May 1851. Cristina died 16 March 1902. Dominic WISE, born 24 Sep 1832. He died in 1917. I have his date of death listed as 1916, but we’ll have to check on that one. Jacob WISE, Jr., born 1835 and died in 1890. John J. WISE, born 12 Sep 1837 and was married 25 Jan 1862. He died 19 Sep 1919. Barnhart WISE, born 2 Feb 1843, married 13 Oct 1868 and died 15 Oct 1919. I have Barnhart listed as “Bernard”; apparently he “Americanized” his name. Joseph E. Wise, born 28 April 1845, married 21 Nov 1871 and died 18 August 1922 in Randolph, Portage, Ohio. I am not sure of the exact order of birth, since I don’t have all the dates. Ray WISE of Ravenna said that the three youngest were born in America, all others in Germany. Ray also said that all are buried at St. Joe in Randolph, except Katherine, who he thinks is buried in Ravenna? He may be mistaken about the oldest, Cristina, as there is a good chance she is buried at St. Mary’s in Massillon, Ohio. Note: Where I have additional information or where my information varies, I have added it in RED text. Perhaps we can join forces and fill in some of the gaps in our knowledge. 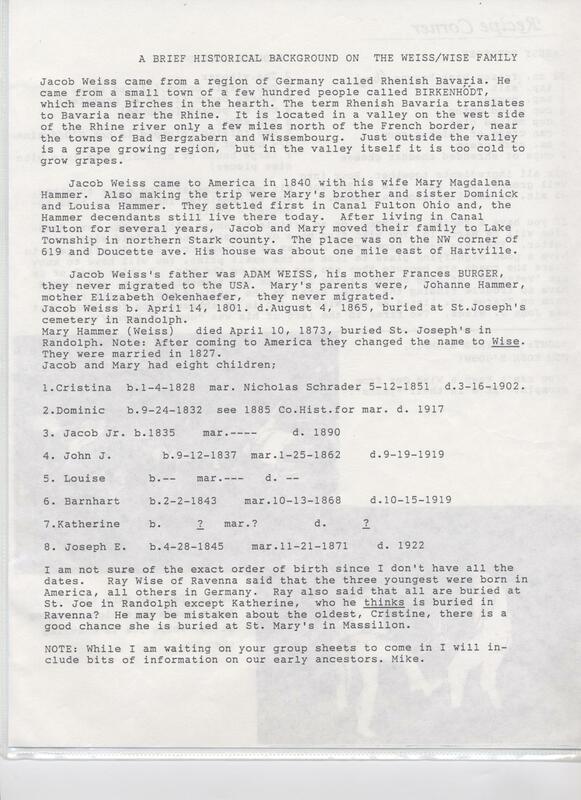 This entry was posted in Burger, Family History, Hammer, Oekenhaefer, Schroeder, St. Joseph Randolph, Weiss, Wise. Bookmark the permalink. Thanks for writing! I did some record checking. Watch Knapp Notes this week — you might see a post about our Moledor connections!